Onion prices had risen to a high of more than Rs 100/kg in December bringing tears to the entire country. This coupled with tomato selling at Rs 40/kg and garlic at Rs 300/kg, the entire country seemed in a desperate situation. The ban on exports and import of onion from Pakistan has now threatened to put breaks on skyrocketing prices on onions ! But whether it is the hoarders, speculation, important ban, climate caused problems – the prices are rising again. And this time it has impacted inflation, pulling it to record levels of 18 percent upwards. The ban of onion exports is the killer blow which has pushed the government and RBI into desperate measures to contain the runaway inflation. The rising prices have impacted everyone as it has become a cycle of sorts. Increase in prices of vegetables increases the price of food in restaurants, canteens, and even at home. If a restaurant serves an airline, the ticket prices may rise which may affect the passengers. Now that may be a far-fetched theory but in the current situation it isn’t unimaginable, right? But there is a certain section of the population which is smiling all the way to the bank because of these rising prices. The first ones are the readymade paste makers of garlic, onion, ginger, tomato and others. Companies like Smith and Jones, Dabur’s Homemade etc. along with Maggi’s sales have hit the roof since the prices rose. Some like Smith and Jones have witnessed 300% increase in their sales while others like Homemade have slightly increased prices, but it hasn’t affected demand one bit. The convenience of use, stability of prices in this highly fluctuating price scenario combined with strong advertising have put them into pole position. The market for cooking pastes and purees is expected to be around Rs 150 cr and growing strongly. One important point to note is that these companies buy these agricultural commodities much in advance which strongly helps them to cope up with large scale price changes. The second spot is taken by modern format retailers whether it is Safal, Reliance Fresh or Food Bazaar. All of us know by now that their advantages of stronger supply chain, good cold storage and cheaper prices put them one level ahead of local vendors. And these same advantages are helping them go one step ahead of these vendors even in current times when prices of all vegetables are shooting up. 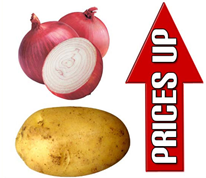 These modern retailers have much cheaper prices, whether it is onion at Rs 49/kg compared to local vendor price of Rs 55/kg, Rs 7/kg for potatoes compared to vendor price of Rs 10/kg or apples at Rs 60-80/kg compared to vendor price of Rs 100/kg. This has ensured that consumers are preferring these retail stores rather than their local vendor. High food & vegetable prices sure seems to be bringing smiles on select few ! this is the situation happening all the year , weather is it raining or not raining . they are finding the story all the year to raise the rate and get more profit. In the earlier article when Onions started rising also I mentioned the same thing. The need of the hour for Indian Government is to develop Food process Industry on was footing. It acts as a sponge for all fluctuations. When prices are low, it encourages Food Process Industry to buy more thereby stabilizing prices. When the prices rise, the product from the process industry increase supply. More than providing stability to prices, it helps nation in conserving agri produce and reducing wastages. 3) People’s habit of using only fresh produce instead of consuming processed food. In west almost 50% of all consumption is processed food. If some enterpreneur looking for starting his own venture, if he reads articles like this, they will realize the potential in India in Food Process Industry and hope it will influence them to go for it, for their own sake and for the nation.